I'm so excited to have teamed up with Lomography to bring you all this super fun giveaway! Readers of my blog will have seen my recent adventures with these awesome vintage style film cameras and you too can now get your hands on one! I’m absolutely loving using my Diana F and can’t wait to post about my latest roll of film which I can happily report was so much more successful than the first roll. Phewee! 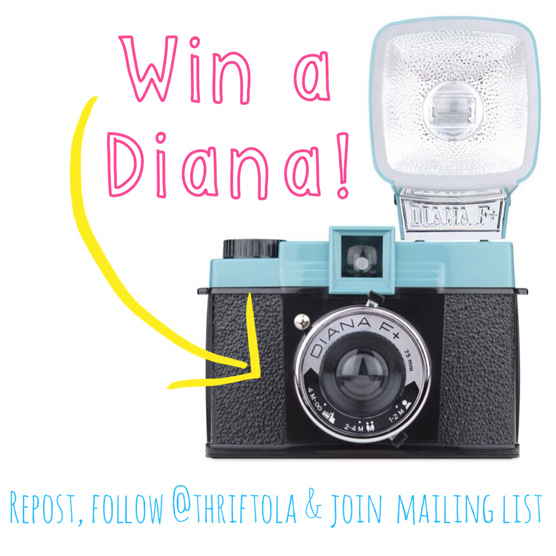 If you too would like to go on an adventure with Diana, it’s super simple to enter my giveaway. 1, Follow me on either Instagram, Facebook or Twitter where you can repost or share the above image. 2, E-mail me so you can be added to the Lomography mailing list. I’ll announce the winner next Thursday 12th June. Good luck! If you ever come accross any old camera equipment be good to know. (8mm ,16mm and 35), reels etc in your thrifty adventures.